Silver Lining Music - Wacken Records release to contain performances from Accept, Europe, Heaven Shall Burn, Kreator and Apocalyptica among others. WITH THE wonderful institution that is the Wacken Festival only a couple of months away, it is time for rock and metalheads worldwide to get into full training for that glorious week…and what better way than by engaging with, and imbibing to, the spectacular highlights of last year’s festival as heard on LIVE AT WACKEN 2017 - 28 YEARS LOUDER THAN HELL, which will be released by SL Music worldwide (except the US & Canada) on July 20th, 2018 via a bumper twin DVD - twin CD pack and also via digital download. With Motörhead/Megadeth/NOFX producer Cameron Webb expertly handling the mix and Mastered by Andrew Alekel (Motorhead/Clutch/Fu Manchu) Live At Wacken 2017 features 45 crunching cuts from the likes of Europe, Kreator, Apocalyptica, Uli Jon Roth, Candlemass, Max & Iggor Cavalera and Turbonegro. The collection also features one of the most stirring festival moments ever captured - the voices of 60,000 Wackenites singing Motörhead’s superb cover of “Heroes” in tribute to Lemmy, the dearly departed (and sorely missed) godfather of rock & metal music. 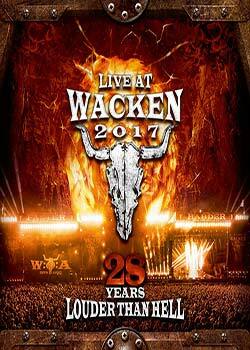 The DVD footage was captured by the expert ICS team at the Wacken Festival under the direction of long-time Wacken designer and creative force Kai Swillus, whose innate knowledge of the Wacken scene and its sensibilities has ensured that all Wacken releases have been storming visual hits with the fans. Consider it entertainment. Consider it proper Wacken training. And consider it an essential purchase for anyone who remotely breathes rock & metal music.